We are in the middle of Campaign ’08 fever and it seems as though one can’t turn on the television without seeing the faces of several candidates from both parties all talking about change. I admit to being caught up in the primaries and the latest polls and news but after awhile the sound bites and photo ops all start to blur together, making the candidates seem very similar to one another. 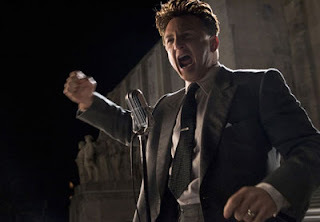 This is definitely not the case for the plain-talking, overly theatrical self-proclaimed hick Willie Stark (Sean Penn) whose rousing speeches that seem to recall fiery sermons help get him elected to the office of governor in the state of Louisiana in writer/director Steven Zaillian’s remake of the 1949’s Best Picture Oscar winner All the King’s Men. No discussions of campaign finance reform or technical double-speak for Stark; instead, he leads a cry of “Nail ‘em up,” to inspire the crowd and prove that he will hold the politicians who’ve been getting wealthy off the poor and abused in the depression era south to task. Of course, power changes people as we see the orange soda pop drinking Stark begin to turn to alchohol, infidelity and shady alliances when he surrounds himself with intellectual, sassy, fast-talking Sadie Burke (Patricia Clarkson), the intimidating crook Lieutenant Governor Tiny Duffy (James Gandolfini), and his gun-wielding driver Sugar Boy (Jackie Earle Haley). The one member of his team that doesn’t seem to fit in with the rest is Men’s narrator Jack Burden (Jude Law), a former newspaper columnist who found he was swept away by the promise of Stark when he first met him decrying a tragedy involving children killed in a schoolhouse and Burden, eager to leave his past life of wealth and privilege one assumes he may in fact be embarrassed by behind him, signs on for the ride. However, having the benefit of his past as a newspaperman, Jack begins to see exactly where the controversial Stark is headed when he employs questionable tactics and ropes some of Burden’s friends and/or family including Kate Winslet, Mark Ruffalo, Anthony Hopkins and Kathy Baker into his plans as visions of white house glory fill his head. Although as IMDb reports, Zaillian stated that he had never seen the original film and adapted the work solely from Robert Penn Warren’s 1946 Pulitzer Prize winning novel, most critics couldn’t help but compare this film to the Oscar winner of the past and point out its considerable flaws and the way it paled in comparison which had Ebert and Roeper so disgusted they named All the King’s Men the Worst Movie of 2006 on their television show. I think that is overstating it quite a bit and even though the first half of the piece plays far better than the second, we forgive the flaws since we’re so dazzled by both Penn (does he ever give a bad performance?) and the superlative writing of Schindler’s List, Falcon and the Snowman, Awakenings, and American Gangster writer Zaillian that we become as swept up by the Huey P. Long inspired Stark as the characters in the piece until his populist, controversial character begins to feel like a one-dimensional cartoon and the heavy-handed conclusion bogs down the quickened pace and performances considerably. The actors, most notably the aforementioned Penn, Law and Clarkson (who, actually a Louisiana native has the most authentic accent) all turn in fine performances but the rest of the cast seems like either window dressing (Winslet and Ruffalo in roles so tiny they could have been phoned in) or Gandolfini, who seems to be playing a period version of his popular Tony Soprano character with a none-too-convincing drawl. Of course, my tolerance for the film as mildly successful (though far too long) was probably helped by the fact like, similar to our writer/director, I had never seen the original and unfortunately had also never had the opportunity to read the novel so had little with which to compare. One thing’s for certain-- it definitely plays better on a smaller screen and proves to be a (mostly) engrossing diversion from the news headlines of politics as usual.